Who needs pizza when Mallorca has coca? Coca is the Catalan equivalent of a pizza, differing from its Italian culinary cousin in that cheese doesn’t feature – so it must be healthier (I tell myself). Eaten as part of a meal or as a snack, coca is usually served at room temperature. Most bakeries on Mallorca bake large rectangular coques and sell portions. A transportable snack, it makes a tasty alternative to a bocadillo (or filled roll). Individual coques may be oval or round and toppings may comprise only a few ingredients. 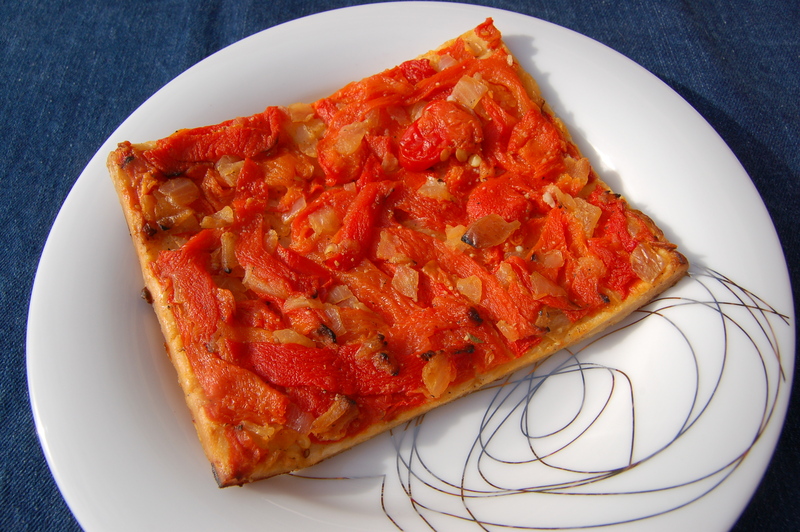 Coca de trempó is probably the most common: a combination of peppers, tomatoes and onions – one of my personal favourites. You can expect to find coca on the menu (or buffet) in some traditional Mallorcan restaurants but, like all dishes, some versions are better than others. If the base is too thick, it turns claggy in the mouth and needs a good gulp of something (preferably one of Mallorca’s excellent wines) to wash it down. And, as with all dishes, everything depends on the quality of the ingredients. Last September, I took my father on a winery tour organised by Mallorca Wine Express. Mid-tour we stopped in the heart of a vineyard to taste a wine and excellent coca de trempó, made by the owner of the business. Sadly, my coeliac father had to miss the latter. I’ve never seen gluten-free coca for sale, so will trying making one for his next visit. Last week I ate a superb one, as part of lunch at Miceli restaurant in the village of Selva (just a couple of kilometres towards the mountains from Inca). Chef/proprietor Marga Coll’s version had a crisp thin base and was topped with salt cod (bacalao) and vegetables. It was probably one of the best cocas I’ve eaten. For information, Miceli changes its menu daily, serving dishes based on what Marga has bought at the market that morning. . . I can also vouch for the delicious coca I’ve eaten at Ca Na Toneta in Caimari, and I’d love to hear if you have eaten any particularly good versions elsewhere on the island. Lunch today is coca de trempó – couldn’t let the photographic ‘model’ go to waste!